Everybody has questions. If yours are about rings, we have answers. At Titanium-Buzz, nothing is more important to us than your satisfaction. Our founder started this company because of the experience he had shopping for a wedding ring, and so for us customer service isn't some marketing cliché. We know exactly how important, and stressful, the decisions you make about your rings can be, and we are committed to making the process easy, affordable, and even fun. Below are the most common questions we get from customers and fans. We also have links to a ton of resources that cover all things rings. If you have a specific question that you don't see addressed here, let us know and we'll get an answer for you. I want to see a physical product before I buy it. Are there demo versions of your rings? What if I have a special request or need to tell you something about my order? 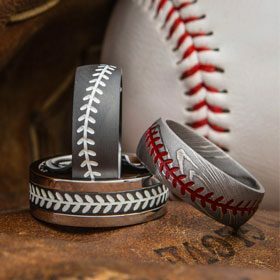 Can I order my ring with personalized engraving? Do your rings come with any kind of guarantee? I only see 1/2 sizes listed for your rings. Can you do 1/4 sizes? I don't know my ring size. How do I find it? What if I'm shopping for an engagement ring and I don't know her size? Do you have a comparison chart for international sizes? I've heard that some rings can't be resized. Is this true? How long will it take for my ring to be completed? I need my ring as soon as possible. Can you put a rush on my order? I have sensitive skin. Is titanium safe for me to wear? What other materials do you offer? What do all these names mean? 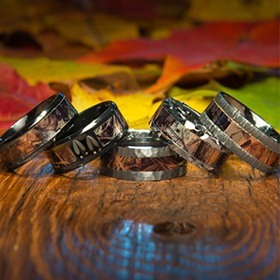 What's the deal with your camo rings? Is it true that your carbon fiber rings have no metal in them? Can my extreme lifestyle damage my ring? You can call us toll-free at 1-866-215-1861. We are in the Eastern time zone and are open Monday - Friday, 8:30 am - 4:30 pm, but if it's after hours or if we're not open for some reason, you can always send us an email and we'll get back to you within the next business day. Yes! We get it. Sometimes a picture on a screen just isn't enough. That's why we have a number of "demo rings" available that can be sent to you for closer examination before you decide to purchase. Unfortunately, our demo rings may not be your specific size, but we can always provide a few different style examples to give you an overall idea of what your ring will look like. If you would like to learn more about our demo rings and have one shipped to you, call 1-866-215-1861 or send us an email. Keep in mind that we only offer top-quality items and that all of our rings are individually created for each of our customers, including you. We will always work with you to ensure your complete satisfaction. During the checkout process, you will see a comments section on the order form. You can add any notes, directions, rush requests, song lyrics, screenplay ideas, or questions you might have to this area. It's your place to say anything you need to say. A member of our staff will review your comments and will follow up with you. We will not make your ring until all of your concerns have been addressed. You can also contact us directly. Yes (usually). 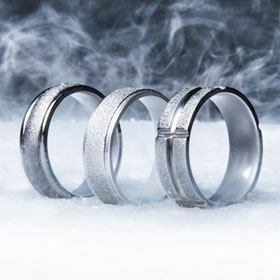 Most of our rings are available with optional personalized engraving for a small fee. For additional information about ring personalization and how our engraving works, please refer to our engraving FAQ. PS: There's nothing wrong with just having us engrave names or a date, but you can always get creative. 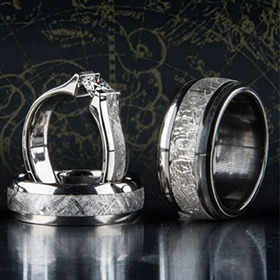 Check out some of our favorite wedding ring engraving ideas that we've seen from our customers. They do. All of our rings are covered by a limited lifetime warranty for issues like breaks and structural failures. This almost never happens, but if it does, you're covered..
We also offer an optional Protection Plan that provides a wide range of additional coverage and benefits. Subscribers to our Protection Plan enjoy free engraving, one free size exchange during the first year, a lifetime of repairs and finishes, theft protection, and much more. All you ever pay for is shipping. Yes. You've probably noticed that most size charts and the like only list whole or half sizes. That works for most people, but if you're one of those folks who know their size down to the quarter, then you'll be happy to hear the vast majority of our rings are available in 1/4 sizes. To request a 1/4 size, all you have to do is select the size closest to yours from the on-screen options before adding an item to your shopping cart. During the checkout process, you will see a comments section on the order form. Simply note the exact size you need, and we will adjust your order accordingly. Please note: 1/4 sizing is not available for 100% carbon fiber rings. The best way to get an accurate ring size is to have your finger measured at your local jewelry store. In fact, we strongly recommend you get measurements taken by at least two or three different jewelers. Measurements can and do vary depending on how the jeweler measures you. Please note: Most of our rings are crafted in a "comfort fit" style. We recommend having your finger sized for a comfort fit band, if possible. Our blog has a pretty exhaustive guide to ring sizing that is full of other tips you can follow to ensure a perfect fit. How is it that in every proposal scene in every movie or TV show, the ring is somehow always a perfect fit? Did the dude just happen to "know" his future fiancée's size? Did he guess really well? (Note: NEVER guess.) How are non-TV people supposed to come by that information? You best option: If she has a ring that she wears sometimes but not all the time, straight up grab it when her back is turned, take it to a local jeweler, have it measured, and then return it when she isn't looking. If stealing borrowing one of her rings isn't an option, then grab a pencil and paper and try to make a trace of one her rings. Make sure it's one she actually wears, and make sure you trace the inner diameter. If all else fails, then consider proposing without a ring and then shop for her engagement ring together. Sure, it's not as romantic as this guy, but it guarantees she'll get a ring that she loves and that fits properly. Many people (including one of the authors of this FAQ) have proposed to their wives this way and it worked out great. Trust us, if she's going to say yes, then she's going to say it regardless of whether there's a ring in front of her. If you want to learn more about ring sizing and its importance, read this article. Yes. If you are from an area outside the US and Canada that uses a different sizing standard, you can match up your size with its US equivalent by checking our international ring size chart. Yes. What makes our rings last so long, unfortunately, is also what makes them difficult to reshape. In most cases, the inherent strength of our products makes them impossible to resize. If you require a different size for your ring, you will likely need to exchange your ring for a new in the correct size. There is usually a remake fee for this service. Subscribers to our Protection Plan are covered by one free size exchange during the first year. That means if your ring stops fitting during the first year you own it (coverage begins the day you place your order), we'll replace your ring for free, no questions asked. All you pay for is the shipping for the exchange. If you are experiencing any sizing issues with your ring, please contact us as soon as possible. We can always be reached at 1-866-215-1861. You can also send us an email. We will do whatever we can to help. For more information, review our complete returns and exchanges policy. As we're fond of saying, almost none of our rings are off-the-shelf items. Building totally custom wedding bands and engagement rings is at the core of who we are. It usually takes about 3 to 10 days to make one of our rings from start to finish, but remember that with any custom item, production time can vary. We strive to keep you as informed of this as possible, and prior to ordering you can almost always find production estimates for a particular style of ring on the item's page. Please note: Some rings, such as Damascus steel rings or rings with diamonds or special modifications, may take up to three weeks to complete. We are very sensitive to life's deadlines and those last-minute headaches that always seem to pop up, and we are very good at ensuring that folks get their rings when they need them. In extreme cases, rush options are available for select styles and we also offer overnight and second-day shipping options for most items. If you think timing is going to be an issue with your order, please contact us with your concerns. We pride ourselves on having some of the fastest lead times in the industry (see above), and once we process your order we waste no time on production. We really do work hard to get your ring to you as fast as possible. We also offer overnight and second-day shipping options once your ring is completed. If you see the production time on a ring is going to be a couple weeks, and you don't have a couple weeks, we may still be able to help you out. The best thing to do is contact us directly. We will let you know right away what rush options are available for the item you want. Call us at 1-866-215-1861, send us an email, or try us by live chat. You can also leave us a note in the comments section of your order. Trust us, if there's a way to get your ring to you in time, we'll get it to you. Please note: Because our rings are custom made, production time may still vary on rush orders. If you are ordering from within the US and don't need your order rushed or expedited, then the answer is nothing. All domestic orders automatically qualify for free ground shipping. Please note: By "domestic," we mean orders shipped within the USA only, including Alaska and Hawaii. There is a $30 USD flat shipping charge for all international orders. If you need your order faster, we also provide overnight and second-day shipping options for most items (regular shipping rates apply). For a complete breakdown of our policies, which really aren't very complicated, please refer to our shipping information page. Until the day when drones finally take over, we will continue to use a variety of shipping methods to get your items to you as efficiently as possible. Typically, we use USPS Priority Mail for all standard ground shipments (free of charge to you), and then use either UPS or FedEx for second-day and overnight shipments. Once your item has been shipped, we will provide you with tracking and delivery information. Our shipping packaging varies by method and by item, but your order matters to us as much as it does to you. We will always choose the best method and packaging for protecting your order in transit. For more information about getting your order faster, or for more about our policies (written in plain English, we promise), please see our shipping information page. Please note: All international shipments are subject to the duties and taxes of the destination country. Once your order leaves the United States, we do not have any control over the shipment. For more information about international shipping, please visit our shipping information page. Yes, yes, and YES. We don't know where it originated, but versions of this rumor have been floating around since the early 2000s, which, coincidentally, is about the same time titanium rings started rising in popularity. We're not saying that gold rings started spreading these stories because they were feeling threatened, but we'll let you draw your own conclusions. In any case, all of the stories about this are false. No one has ever lost a finger due to a stuck titanium ring, and no one has ever needed surgery to get theirs removed. Titanium may be a king among metals, but it's not indestructible. It has a strength threshold just like other materials and any titanium ring can be cut in an emergency using standard equipment found in hospitals, ambulances, doctors' offices, and jewelry workshops. You bet. It may be a tough material, but it's not tough on your skin. Titanium is a natural element and is one of the few hypoallergenic metals. It has been rarely known to cause any irritation to skin, unlike a few other metals we could name (*cough* goldringswithnickel *cough*). PS: Our black zirconium rings and cobalt chrome rings are hypoallergenic, too. We offer rings in a wide range of materials, but we aren't afraid to play favorites. In addition to titanium, many of our rings are made from black zirconium, carbon fiber, cobalt chrome, Damascus steel, or a combination of these. Why focus on these five materials? Easy. They're the best. All of them have comparable levels of strength and durability, all are hypoallergenic, and all have wickedly unique properties that make them responsible for some of the most exciting jewelry being produced today. Which metal is right for you? Everyone's different, so we put together a comprehensive guide to help you decide. We invented the camo ring (really, we did), and since the day we unleased them on the world they've been our most popular style. We started with a few designs and now offer hundreds, with more being added to the mix all the time. Thanks to their enduring popularity, we get a lot of questions about these rings, more than just about anything we offer. Lucky for us, we happen to know just about all there is to know, and we've put together a complete camo rings FAQ that covers everything. Some do, but some don't. Carbon fiber looks awesome when paired up with exotic metals, but we also have a special collection of rings where it's nothing but 100% carbon fiber all day, every day. And before you ask, no, these rings aren't flimsy. They aren't like rubber or some kind of squishy plastic. They are as hard and as durable as any metal out there. The same qualities that enable carbon fiber to be an integral part of everything from racecars to jetfighters make it possible to create a piece of CF jewelry that is unstoppable. Check 'em out for yourself and you'll see what we mean. Slow down a sec, Mr. Knievel. Your wedding band may be stronger than your rocket cycle, but any ring short of one made out of pure diamond can be scratched. Our rings are made from some of the hardest materials ever used to forge jewelry, but all rings, no matter what they're made of or where they came from, will show some wear and tear over time. What makes our rings special is they don't wear down the same way as many other pieces of jewelry. You can wear your ring every day for a lifetime and it will continue to look great for as long as you exercise proper care. Note the emphasized part of that sentence. Reenacting that scene from Lord of the Rings and hitting your ring with an axe is not proper care. All rings (except for maybe the One Ring) can be damaged by abuse. To find out which metal or type of ring is the best fit for your lifestyle, read our guide and become wise in the ways of alternative metal (we mean actual metal, not alt-metal). The best way to clean your titanium ring is also the best way to wash your hands: With mild soap and warm water. That's all that it takes. If someone shows up on your doorstep claiming they have the perfect chemical solution for cleaning your ring (it could happen), send them packing. This is true for all of our rings, whether they be born of titanium, black zirconium, carbon fiber, cobalt chrome, or Damascus steel. Nothing we offer needs anything more than some good old-fashioned hand soap and water. If you want to really gussy up your ring and give it some extra shine, most local jewelers offer ring polishing. But why bother with that when you can go straight to the source? Send your ring to us and we'll give your ring a full refinishing and send it back to you for free. All you have to pay for is shipping -- or, if you're in the Linden area, then we are your local jeweler so just stop on by and drop off your ring. If you're more of the do-it-yourself type, then we have about information about how to keep your ring looking like new posted on our blog.